Republicans have never liked Social Security, going all the way back to August 14, 1935, when President Franklin D. Roosevelt signed the Social Security Act into law. For decades, congressional Republicans, rigorously supported by Republican presidents, have been attempting to steal the trillions from the “lock-box” of the self-sustaining Social Security Trust Fund. 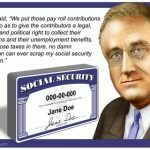 The principle message of Social Security’s opponents, perpetrated since Roosevelt’s signature was dry, is the blatant lie that the checks are handouts forced from unwilling taxpayers. In reality, these payments come from the workers’ own earnings with 6.2% of gross withheld and deposited in special mandated savings accounts authorized by the “Federal Insurance Contributions Act” (FICA).